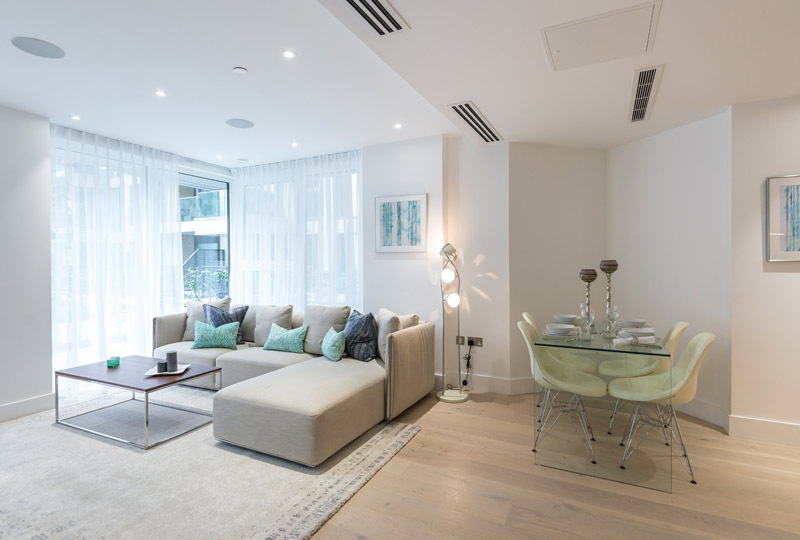 ani M INTERIORS was approached by a returning client to create a beautiful interior that would tick all the right boxes for prospective buyers. 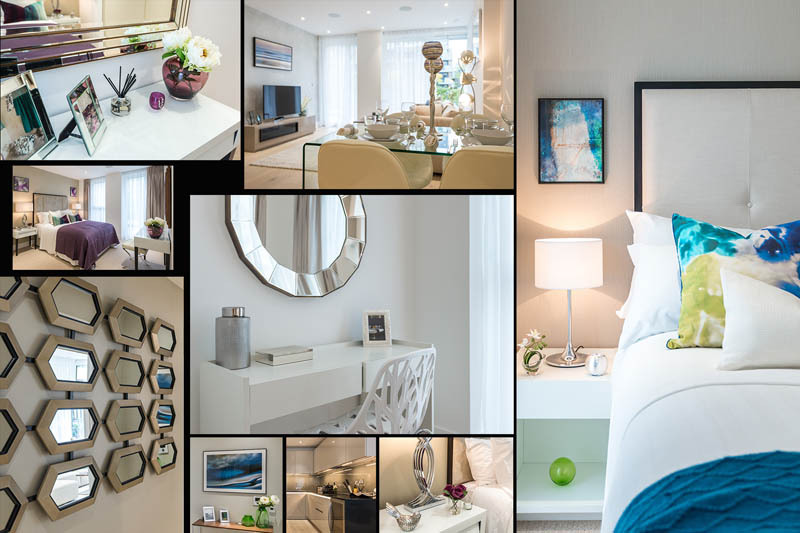 The two-bedroom apartment is situated in the Fulham Riverside development, offering stunning views of the River Thames and beyond. The brief was to design a contemporary space with modern furnishings and bold accent colours that would appeal to a young, professional couple. The client disliked the generic white walls throughout the new apartment and wanted design details, such as feature wallpaper, to lift the space and give it character. The team began with plans for the hallway. As the welcoming space, the plain white walls were softened with grey and a large artwork by the front door draws the visitor’s eyes as they enter. The hallway is darker than the rest of the apartment so a cleverly positioned mirror helps borrow the light from the main living space and encourages the visitor to explore further. The metallic grey wallpaper in the living area helps maximise the light from corner windows while glass and metal finishes help to keep the light flowing throughout. As this one room houses the kitchen, dining area and reception room the furniture needs to work hard to create different zones. An L-shaped sofa in soft grey helps to separate the reception room from the cooking and dining area. A plush, grey rug and walnut and chrome coffee table, echoing a Le Corbusier creation, help to define the space for rest and relaxation. While the furniture marks out the different areas, the colour flow throughout is soft grey accented by blue, jade and turquoise. It harmonises the space and the splashes of colour add some energy to the neutrals. For the main bedroom, the continuation of the neutral greys and creams keep a sense of tranquillity. Here, the accents of blue, jade and turquoise are paired with a deep, rich aubergine. With clever use of these colours and by layering textures, the space becomes a sumptuous boudoir of dark wood, silk and velvet – irresistible to buyers. 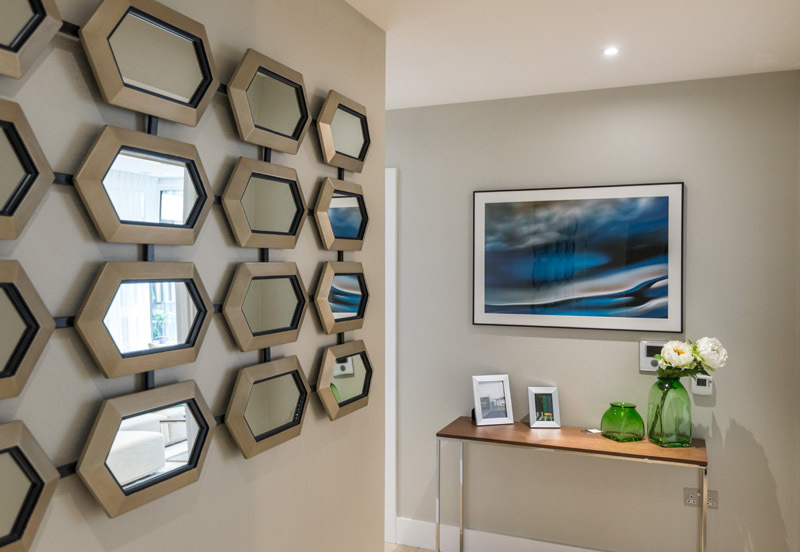 It’s a technique that ani M INTERIORS has used to great effect on similar projects at the Kew Bridge Road development. For the second bedroom, the same neutral tones of grey and white are brought to life with bold teal, blue and lime green shades. For a professional couple this would be used as a guest bedroom so it has to look smart, crisp and clean. 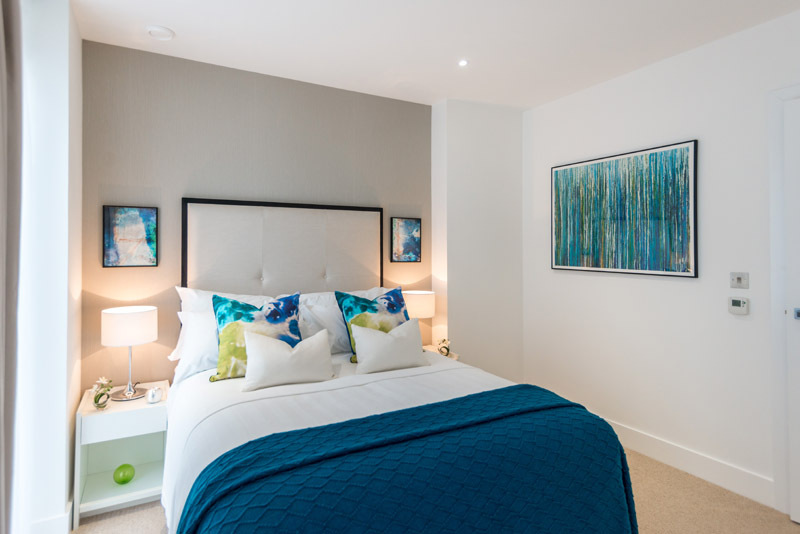 As the room is smaller, clever positioning of artwork on the main wall and either side of the headboard draws the eye and defines the space, while a bevelled statement mirror makes the best use of the light. It is design techniques such as these that create a sense of space. The room is light, bright and airy, perfect for welcoming guests. 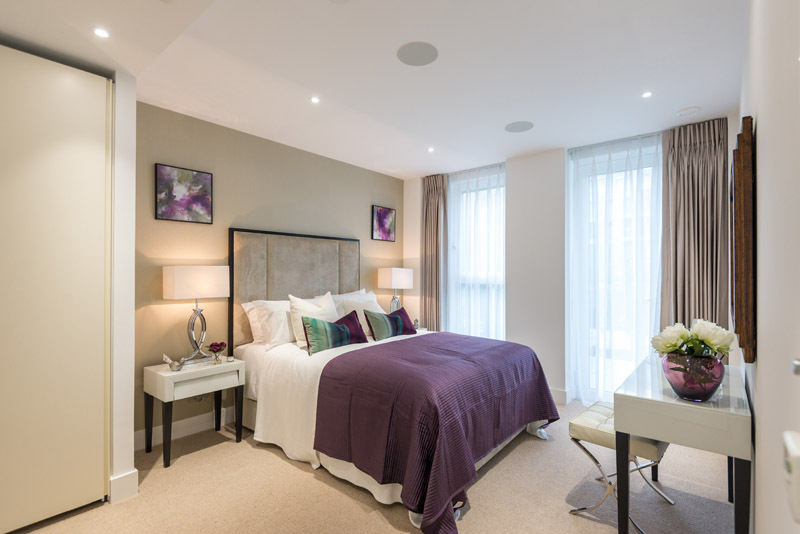 For more examples of this technique, why not take a look at this two-bedroom apartment at Dickens Yard, Ealing? The property has been transformed from a stark, white new-build with little character into a sophisticated home and dressed to suit a professional couple, with minimal inconvenience to the property’s owner. Ready for market, buyers will no doubt jostle each other for the chance to snap up this high-end property. If you would like advice on how to best present your property for sale, contact the ani M INTERIORS team who will be happy to help transform it into an object of desire.